Grand shrines and sacred sites of Buddhist sanctuary and mountain ascetics are linked by a network of pilgrimage routes. Together these shrines, sites and pilgrimage routes are recognised as UNESCO World Cultural Heritage. 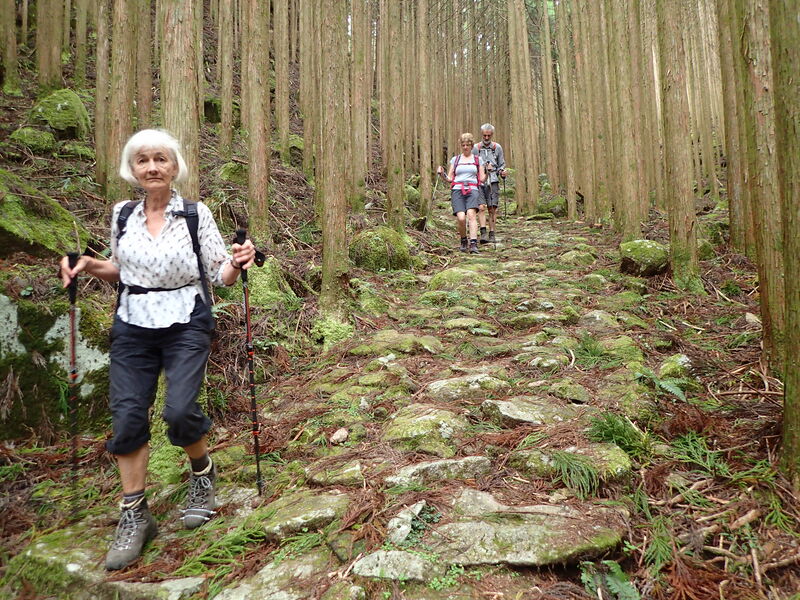 The Kumano Kodo is “linked” to the only other UNESCO recognised pilgrimage route, the Way of St James in Spain (Camino de Santiago), enabling walkers to become “Dual Pilgrims”. For more than a thousand years the Kumano area has been a place where Buddhism, Shinto and nature worship have been combined, adjusted and redefined – syncretised. Spirits of the dead inhabit the peaks. Pilgrims sought healing, regeneration and salvation. In this “paradise on earth” they walked to be spiritually and physically purified. In Shugendo, a combination of folk religion, shamanism, Taoism, Buddhism and Shinto, followers sought to gain supernatural powers through ascetic practices in the mountains. The early Kumano, 794 – 1185, was the golden age of pilgrimage reserved for the Imperial and aristocratic families who trekked in great assemblages. Later, 1185 – 1333, the Samurai warrior class continued the tradition and then from 1336 – 1573 came a wave of more common people. 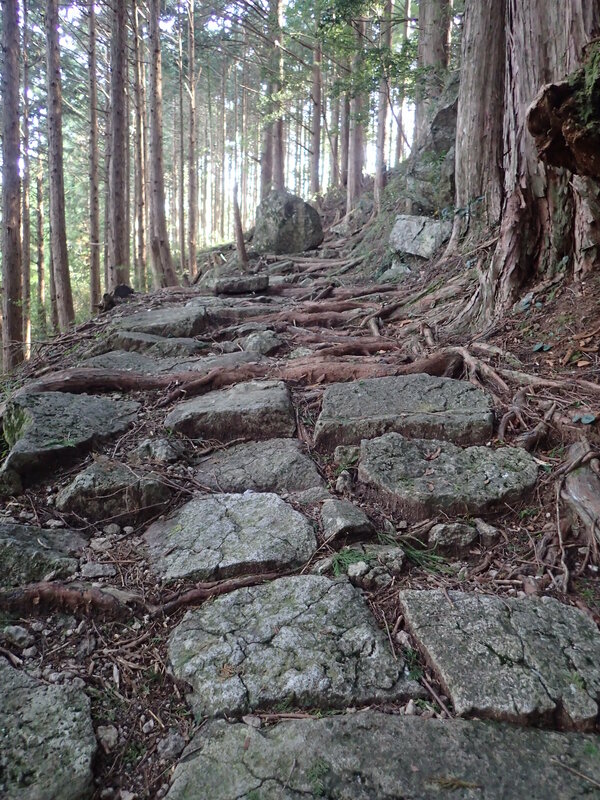 During the 17th to 19th century the Kumano became very well frequented. 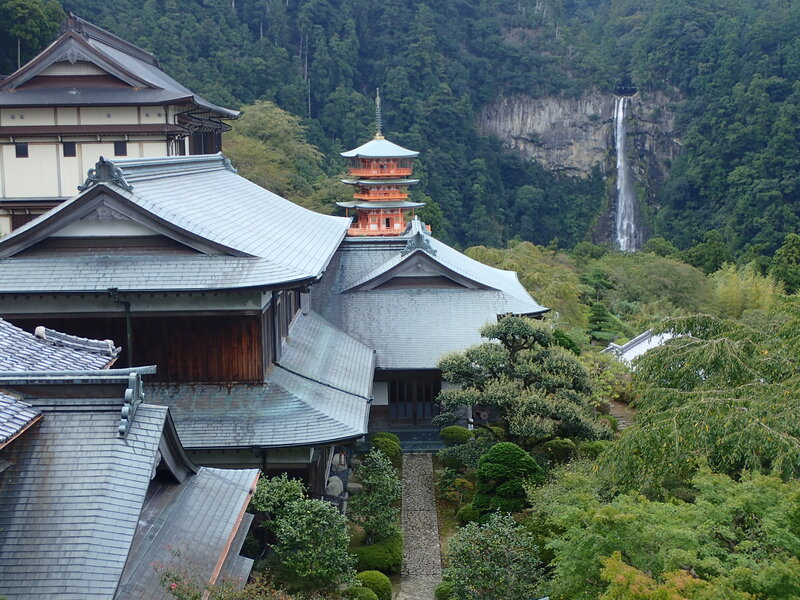 Under a stricter regime the Kumano fell into decline from the late 19th century. Only very recently since the 1990s have contemporary Japanese people rediscovered the pilgrimage routes and then in the last 10 years has it been opened up to westerners. Access was easy. Train to Kii Tanabe. The tourist info at the train station has free info booklets with maps. The bus station is right outside the station. Lots of helpful people speak English and were very friendly. An ATM is nearby and probably supermarket if required. Buses departed for Hongu stopping at Takijiri Oji every hour. The bus took 40 mins. 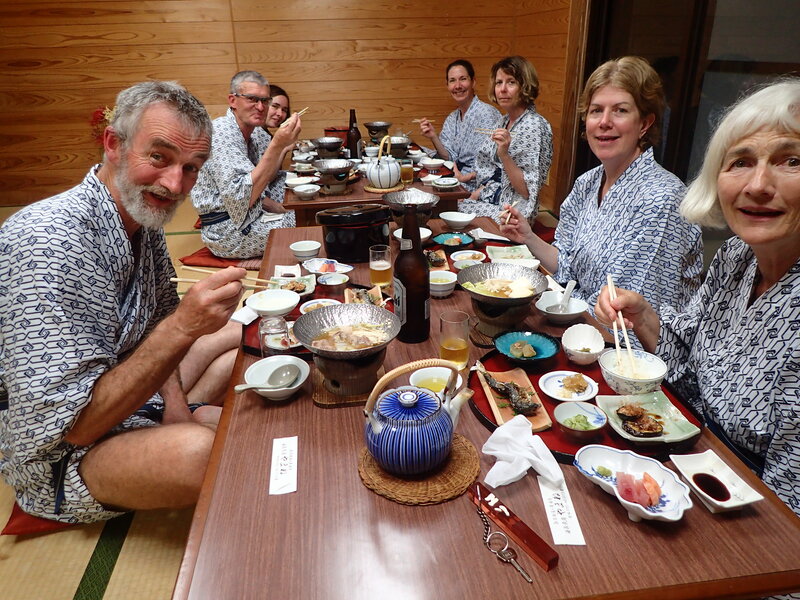 All accommodation and luggage transfers should be pre booked from the Kumano Kodo website which is a little complex but can be worked out and the website does everything once you learn how to use it for bookings. A booking request will take a few days to process. We had a group of 9 and some nights we had to be accommodated at different places in the same locality. At Takijiri Oji we were met by our luggage transfer people with “welcome” signs. There is a Kumano Kodo visitor center with more booklets of maps and stamp booklets that are both free but must be requested. Water is available in the center. The pilgrimage starts at Takijiri Oji where there is a shrine, stamp station and covered shelter. An ascent of 300 m steep hiking took us up through beautiful forest on a path which was held together by the roots of many trees. It twisted and zig zagged and wound past rocks and mossy logs. An optional crawl through a tight rock cave added challenge. Towards the first flattening the trail followed a narrow ridge line. Stone steps and flatter open trails led us to the first lookout which revealed marvelous views of very steep hill slopes and deep valleys, all thickly forested in varied shades of dark green. The forest reminded me of ninja movies from my childhood where characters leapt backwards up into the trees from the ground and the “Twilight” films – brooding, silent, still. Small villages nestled in the valley bottoms. On the way up and across the ridge top we chattered, catching up with those in the group we knew and getting to know the others, gradually establishing and deepening the friendships with each other. Further on we rested at small shrines then entered a village perched on the ridge. A special walkers’ rest area provided excellent views of distant ranges foregrounded by terraced vegetable and rice gardens. Yellow and pink and white flowers bordered a narrow road. An old man proudly showed us his beautiful bonsai trees and well-tended garden. A larger shrine had been freshly painted. Accommodation – delightful hospitality, very comfortable rooms with stunning views across the valley. Hot bath with glimpses to the distant mountains. Sumptuous food. Good company. In the morning showers swept up the deep valley to our North. Mist rose and wisped between the forest and a low layer of heavy cloud in a changing series of Japanese landscape paintings. Birdcalls, crickets, and breeze made up the soundscape. Almost alive with a watchful presence the misty mountains had stood bearing witness to our fleeting passing and even to that of the pilgrims on the Kumano Kodo from across the centuries. What changes would they endure in the future I wondered. A rainbow coloured the ranges auspiciously as we started walking. A good omen for the day ahead. Uphill through the village. Rainfall flowed at the roadside and turned a small waterwheel. Forest. Uphill. Sunlight streamed occasionally through the canopy. Dappled light then dim as cloud and mist vapours rose through trunks. Damp. Ferny forest floor on steep slopes under tall cedar trees. A pond overhung by delicate green. Shrines, red raised mini shelters, ancient standing stones, jizos alone beside the mountain path. The narrow track was carved into steep hill sides. Beautiful light, soft, changing with the vegetation and weather. Countless thousands of trees. Eerie birdcall. We walked, sometimes chatting, sometimes quiet and alone with our own thoughts, tuned in to the landscape, to the past, to our own inner worlds. Brightly coloured in our designer outdoor gear contrasted the greens and browns of earth and plants. Mosses covered trunks growing and rotten, delicate fungi, surprising red crabs scuttled. Rest, eat, laughed together, regained hydration lost in copious sweat. Humid. Warm. Hard work uphill. The trail is well signposted and mapped. 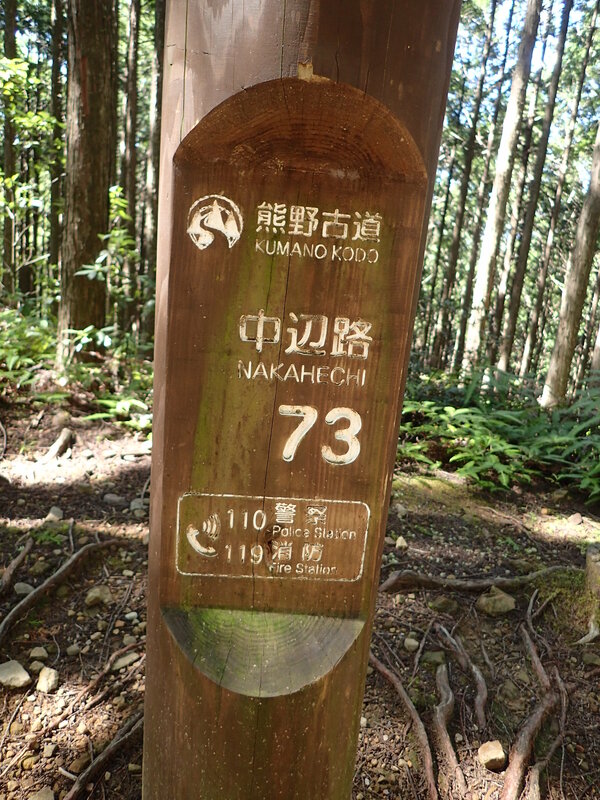 “Kumano Kodo” with arrows and “Not Kumano Kodo” indicated diverging ways not to go. Distances. Interpretive information signs at key points of cultural interest. We stayed in touch with a couple of other groups, Australians, an older Japanese couple, and others. Streams flowed over smooth stones. The sound of running water. Log bridges. Another small shrine. A place to collect another stamp in my pilgrim booklet. Lunch shared, plans made for the next day as we had to split up for different accommodations. Bamboo in amongst the forest cedars. Large village, paved road, cup of tea. Then uphill on a narrow road. More uphill. Tsugizakura-Oji shrine at the top of the hill. Magnificent cedar trees, like an ancient growing cathedral. Tori gate, stone steps led up between the giants. We are quiet and awed again by the connection of nature, spiritual pursuit, homage. At sunset the forested hills across the valley turned iridescent green. 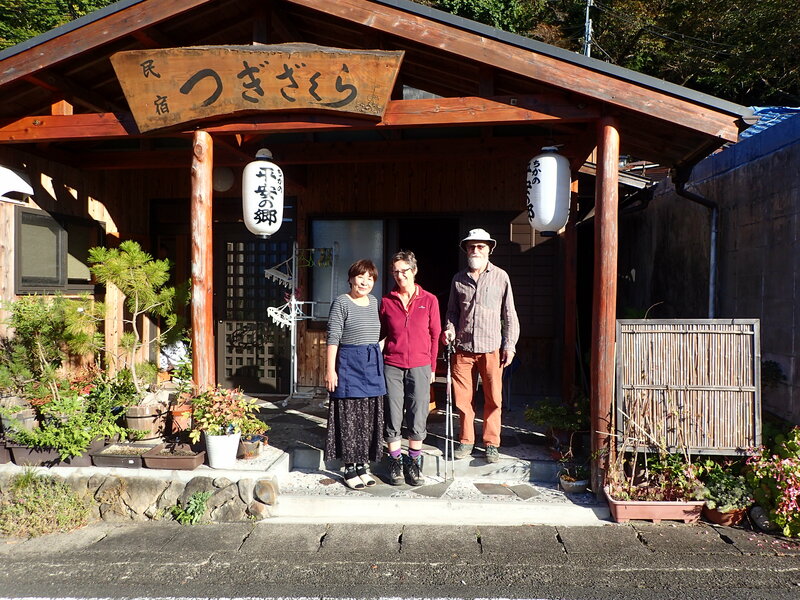 Our small guesthouse, Minshuku Tsugizakura, became a door opening onto the best Japanese hospitality we had experienced. Comfortable room, a very friendly older couple. It only holds 6 people and each was treated like a queen or king. The sumptuous meal was prepared by, Mr Yuba, a retired chef with 50 years Tokyo hotel experience and a passion for creating the tastiest dishes. The food was served and interpreted for us by, Christopher, a New Zealand Japanese with impeccable English and Japanese. Conversations ranged across diverse subjects adding a deeper layer to the “Masterchef” cuisine. This experience was an honour and privilege to be treated to. Bath, tired, plum wine, sleep. Breakfast was a replay of dinner with a fusion mix of Japanese-western friendly micro dishes. Bacon and eggs Japanese style, fruits and yoghurt, orange juice and then fish, tofu, pickles, salad etc. After copious thanks and smiles and gratitude for the extraordinary hospitality our hostess drove us down to the bus stop. We bussed through a short section of road walking to make a shorter day which enabled us to get to Yunomine, a famous onsen village. Much of the trail is serviced by local buses from nearby villages so the walk can be made extremely flexible based on time constraints and physical capabilities. From Hosshinmon-oji we walked through small settlements. Fecund veggie patches and what appeared to be rows of tea hedges. Many houses fronting onto the route had quirky carved figures displayed for hikers. From a hilltop shrine we glimpsed Hongu, a final destination for the ancient pilgrims, the place of one of the primary temple complexes. I walked alone for a little and pondered. 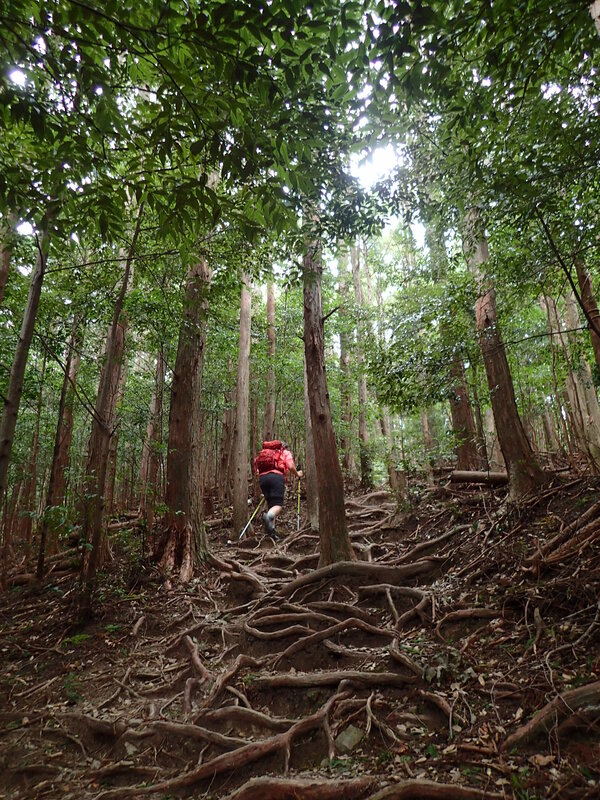 If part of our hike, our journey was to be something of a pilgrimage on the Kumano Kodo what is it that we were trying to find? To discover? To pay homage to? To learn? To connect with? that brings a deeper meaning to our walking together. What would we “take home after internalising our experiences?” Like the lotus flower – I can grow in strength into something fine, acknowledging the darker and negative sides of myself, working thru them to seek beauty in myself, relationships and my impact on the world – perhaps to leave criticism of others behind, to make my garden more beautiful, to be careful and positive in my dealings with others. To gain a deeper awareness and understanding of the pursuit of challenge and lifefullness thru mountain asceticism and effort. To gain a more appreciation of the universality of our human seeking for deeper meaning in life connected to the cosmos. Forest under bright sunlight contrasted the previous day’s somber mistyness. Ferns, rooted pathway, stone steps, sandstone worn from centuries of footfalls. Less humidity. A high vantage point provided distant views of a giant Tori gate in the valley below. The famous temple of Kumano Hongu Taisha seemed to rise out of the land, made of timber with a thick thatched roof and brightly coloured wall hangings. Incense and smoke – a purification symbol. The area was busy with walkers and day trippers. We lunched in the grounds nearby, bento boxes packed with goodies and rice balls wrapped in leaves. Stamps pilgrim booklets. Left the town, exiting under the massive Tori gate, the biggest in Japan. Up, up and up. Steep root bound steps in forest that got darker again. Mosses, ferns. A small shrine and the remains of a very old tea house – rest. More upwards effort. Then the trail showed its incredible age. It wound down a narrow ridge on a pathway that had been worn into a deep groove, steeply down, down. Crossed a stone bridge into the old onsen village. Sulphur smells of the hot mineral waters mixed with the aromas of timber. The constant sound of running water from a stream that ran through the middle of the settlement. Onsen. Relax. Washed away the day’s sweat. Conversation in the bath about Jung’s collective consciousness connecting with the Buddhist concept of the universal consciousness or mind. Hot mineral salted water. Clean. Washed through. Another series of culinary delights at dinner seated on the floor. And later a cooler evening. A short bus ride took us to the next trail head at Ukegawa. At the start of the trail a newish sign in four languages proclaimed “Peace to the World”. Coloured flowers in gardens. Steep uphill for 400m. Through the back yards of houses. Into the forest. The weather was clear and warming but a gentle cooling breeze blew across the hills. We made our way upwards steadily. We were getting into a rhythm with the days and the group. The forest and hills, greens and browns became like home, meditative. A time to think and reflect. A time to interchange. We rested at the remains of a tea house that had been very busy on the route during the Edo period between 600 and 848 AD. The antiquity of the path we were following added a huge depth of history to our journey. At times we walked along high, narrow ridges where the slopes on each side plummeted away. Some sections of track were carved into the steeps and very old stone walls hold it in place in others. Small wooden bridges crossed streamways. Lush ferns, moss, tangled undergrowth, open forest. 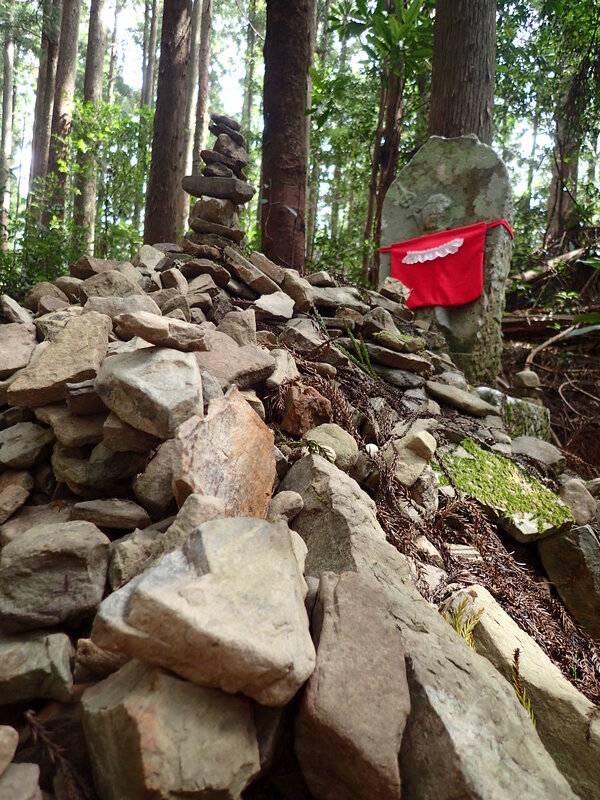 A small, solitary Jizo shrine was perched atop a pile of small stones. I felt quite affected by the script that described this. 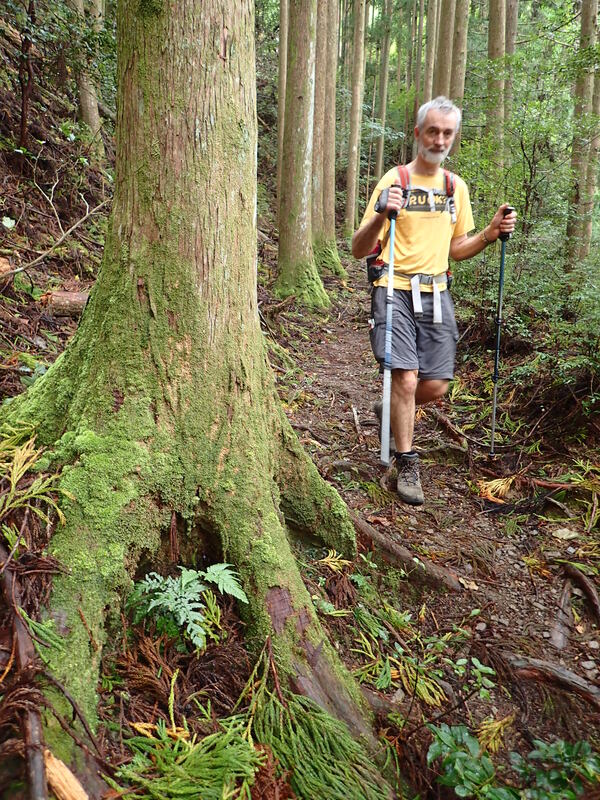 It seemed to encapsulate a key part of the rich and mythical nature of the spiritual belief of the people of the past, and perhaps the present also, that pilgrimaged along this Kumano Kodo. The lyrical description, the story, the rawness of my own mother’s recent passing, the thought of young children dying and the large pile of small stones struck a chord deep inside me. A rare opening in the forest which coincided with a high point revealed a panorama of hills and mountains that faded from green to blue into the distance. We morning teaed and chattered and laughed together. 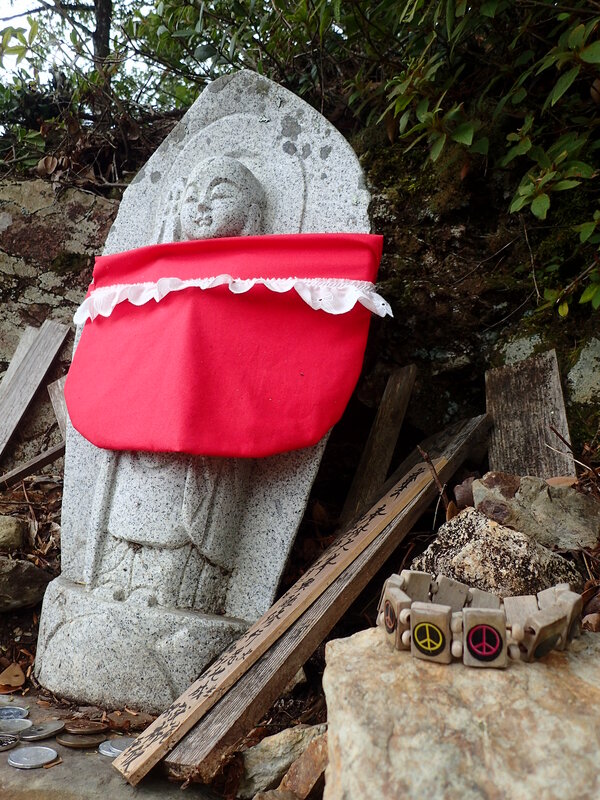 A small Jizo watched over us. At its feet a recent hiker had laid a small bracelet as an offering that was inscribed with colourful peace signs. At first I was dismayed at the spoiling of the sanctity of the tiny shrine but on reflection I thought of it as a form of syncretising of modern beliefs and symbolism with those of the ancients. 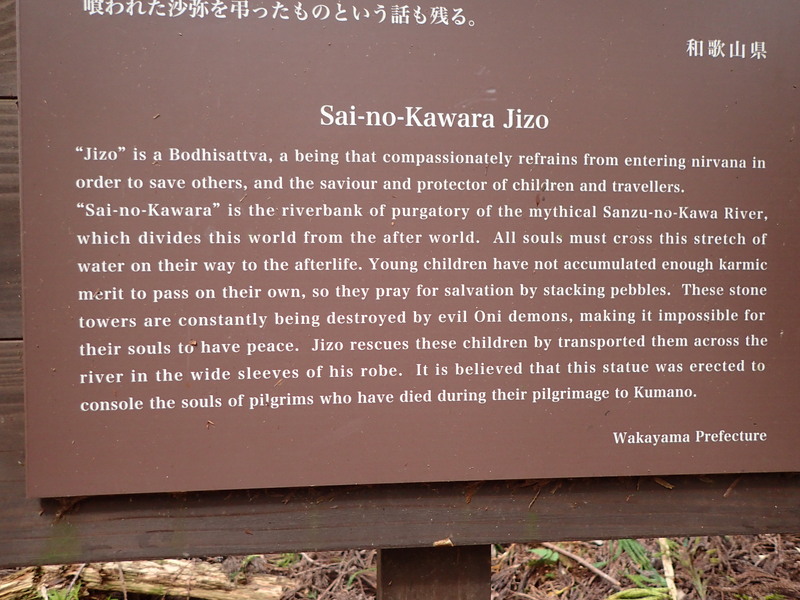 This is exactly what had been taking place over millennia in the Kumano in the merging, blending, mixing and coming together of different forms of Buddhism, Shinto, Taoism, shamanism, folk religion and Shugendo. Undulating terrain followed for several kilometres. We lunched on our bento boxes at a shelter on the site of another old tea house ruin. Then downhill. Past poem monuments and small shrines. I walked alone for a time with some music – a hybrid chant overlain with lilting electric guitar – that connected immediately the inner landscape with the outer world. And more steeply down. Stone steps. Smooth river rocks had been transported high onto the hill to stabilise the path and in places to form a tessellated pavement which could have proved difficult in wet conditions. For some of us with joint issues the down was much harder than the up. Eventually to the village. And the river, pristine, clear and deeper green water flowed over rocks and pebbles. An old school had been converted cleverly to accommodate walkers in comfort at Koguchi. 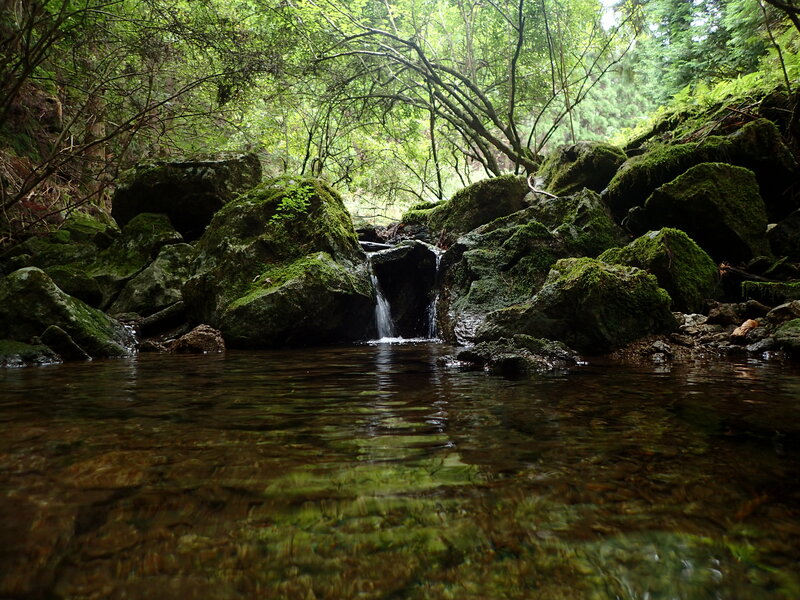 We swam in the cold water in gently swirling pools below a riverside shrine. More delicious food for dinner. Plans were made for an early start to the challenging last day. Moonlight suffused through paper screens. The flowing stream sounded outside our window. Smell of timber. The trek over the Ogumotori-goe section is the hardest of the Nakahechi Route. A long day ascending, traversing and descending a large mountain. Straight into mossy stone steps, up and up and up. Forest. Chat and step up a thousand times and then a break and then again. The incline was well graded, not as steep as anticipated. A boot repair with zip ties seemed to be working well. We kept to a slow and steady pace. A flat section half way up provided a little welcome relief. Maybe it was the meditative nature of repetitive movement through the forest landscape that made the actual nature of the path so interesting. Large stone pavements, smooth rocks heavily mossed at the edges of the “way”, steps edged with triangular shaped blocks, twisted cedar roots, logs that hold back erosion and my favourite a large ascending smooth slab that could have been treacherous without pegged in logs affixed horizontally. In places huge gnarled trees had grown into the side of the path and occasionally a large boulder had come to rest in the center. At one point golden light beckoned through the trees from higher up. Under foot constantly changed and surprised. Flat shelves had been excavated and held strong with stone retaining walls. These had become overgrown through the centuries. In ages past this area had been a small village of accommodating guest houses. I imagined the noise and activity of owners hustling pilgrims to stay in their lodgings, the smells of cooking, smoke from fires, and walkers, some struggling uphill and others in high spirits nearing the completion of their journeys with one last mountain to cross. I was able to feel a small connection, in my own struggles upwards, with the Shugendo who sought to gain supernatural powers through ascetic practices in the mountains. Stone poem plinths had been placed at regular intervals. I wished I could have read each inscription, the Japanese script appeared evocative and mysterious. Brendon’s altimeter GPS watch indicated earlier than expected our imminent arrival at the high point and still in good condition we made Echizen-toge Pass. Small celebrations, chocolate and a group photo. Thankfully downwards for a short time took us to a beautiful stream. 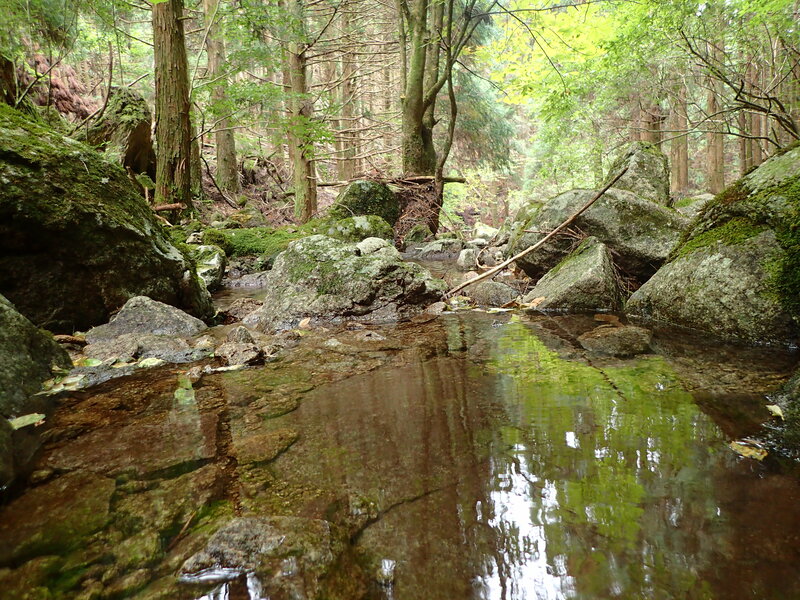 Grottos, mossy boulders, flowing water, ponds, overhanging delicate green foliage. Reflections. Up and over an intermediate hill on the larger ridge line to the remains of an old tea house. Now there is a forestry road and in spite of guidebook exhortations that there are no facilities on this day’s walk there was a flushing toilet, shelter and a drink vending machine. The small cans of hot coffee from the machine proved very popular. Jenny shared sweet mung bean cakes carried from the day before. We undulated on the forestry road and the trail along the tops. Water flowed gently beside and over the path flagstones at times. Like characters from Lord of The Rings we passed through the “Abode of the Dead”, “the souls of the dead gravitate to these higher mountains, where spirits inhabit this section of trail”. The forest then parted to reveal a rare view of the region ahead – the ocean, convoluted coastline, a small seaside town – our ultimate destination. Bob stood tall on a tree stump. Laura and I did ninja jumps in the trees. Our finish was in sight way below. And we all ate rice balls for lunch, again. Down, down, down. Joints complained. Knees, hips, ankles. It was a long way to the base. Eventually our journey ended at Kumano Nachi Taisha, one of three grand shrines of the Kumano. The temple complex was wonderful. 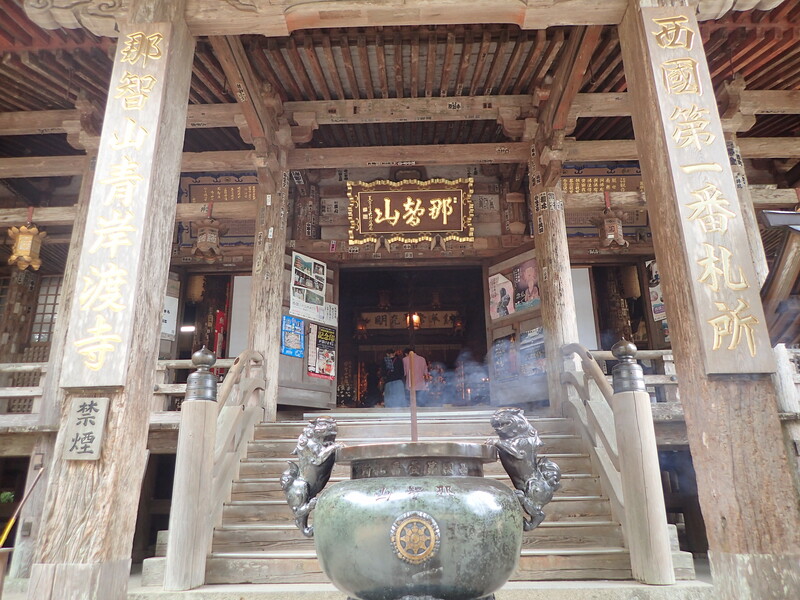 Incense fragranced the air at the entrance to ancient wooden temples. 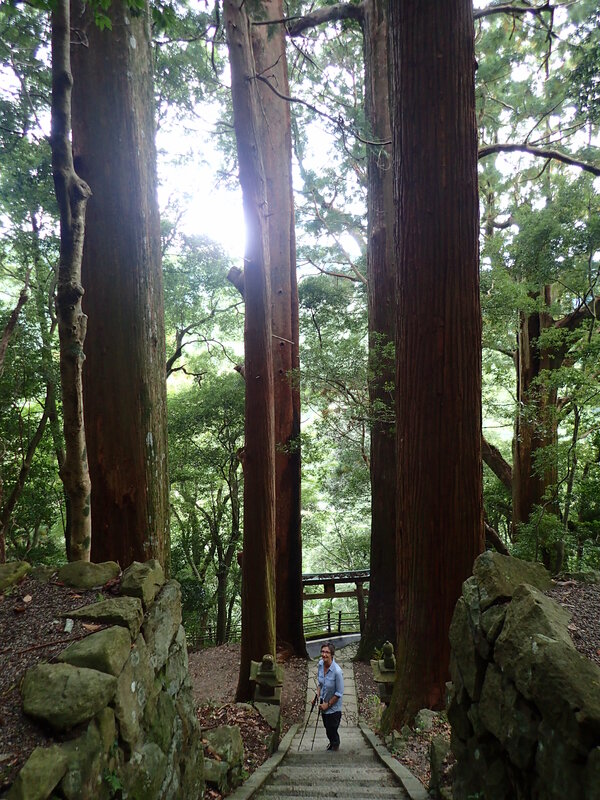 A massive old-growth camphor tree, incorporated into the terraced grounds, has a narrow cleft in its base through which pilgrims can pass into rebirth. From the terraces a magnificent view of a colourful three storied pagoda shrine in the foreground and the plunging Nachi-no-Otaki falls, the highest in Japan. We stamped our pilgrim booklets and walked on tired legs to the bus stop. Later at the coast in outdoor onsens we soaked in hot mineral water while looking out over the smooth green sea to other islands. The setting sun touched high clouds with colour. Raptors floated effortlessly over the water and a fish jumped. The natural world rolled ever onward and our “other” journey continued. 14km, 1260m up, 930m down. Koguchi – Kumano Nachi Taisha. 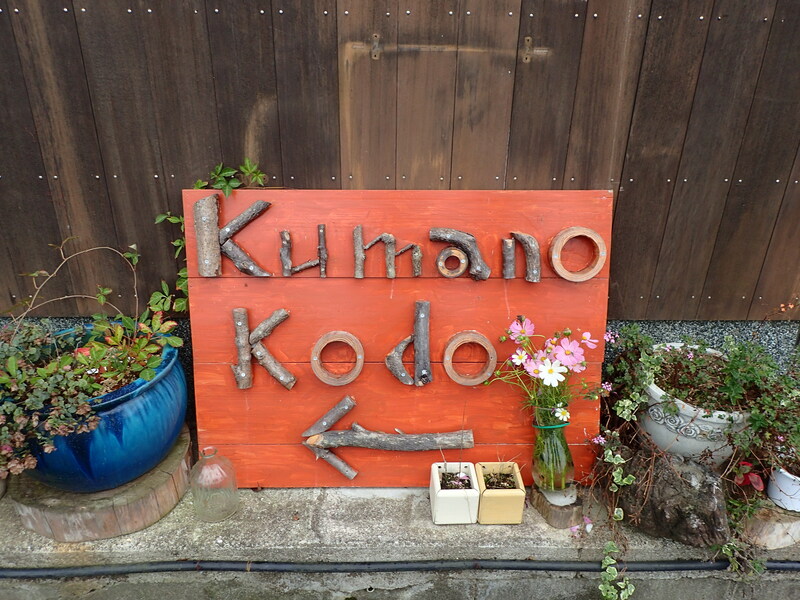 Bookings – for accom and luggage transfer done through Kumano Travel (see note below). The website is excellent once you have engaged with the route. Costs – package for 5 nights accom, dinner and breakfast and some bento lunch boxes, and luggage transfer was about $700AU per person. Extras were for drinks, snacks, onsens etc. Food – provided was very Japanese. Dinners are generally sumptuous. The occasional mini mart in villages provided more variation. Suggest you take tea and coffee and other special drinks and powdered milk if you are addicted to these otherwise plenty of green tea provided. Take a coffee mug? Bring some muesli and powdered milk if you struggle with Japanese breakfast. Suggest making use of mini marts to stock up on snacks. 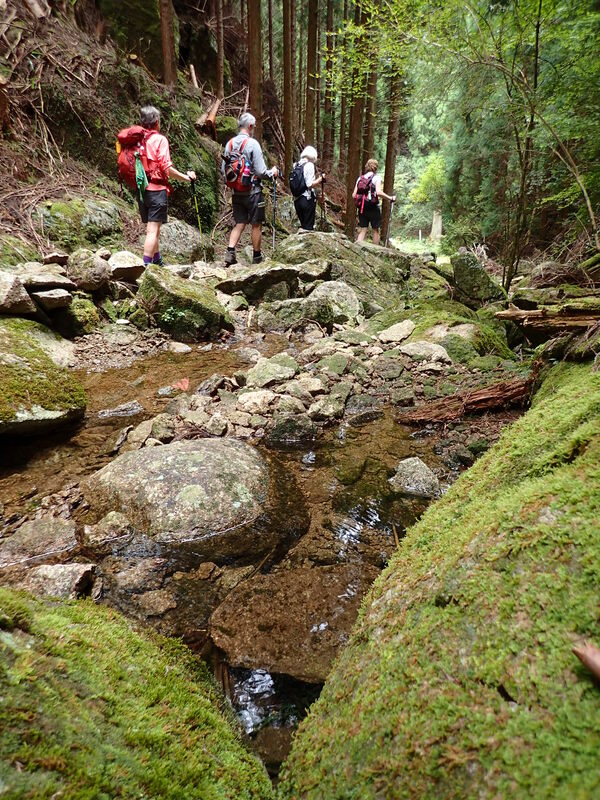 Pace – we walked slower than on a standard hike/bushwalk because we had shorter days planned but also because we found there were lots of interesting things to investigate along the way. Also there was quite a lot of up and down. Path – ancient and mostly well-formed but could be slippery in the wet. Walking poles – highly recommended to have 2 in case of wet conditions and also to ease the downhills. Water – fill up enough for each day – at least 2 litres – each morning. Vending machines for drinks also available. Map booklets – maps should probably be printed from the Kumano Travel website before you come in case you can’t get them in Japan. They are available from Tourist office in Kii Tanabe, the Kumano Heritage Centre at Takijiri and some places along the way. Stamp booklets – each of the special places has a very nice little unique stamp that can be collected into a Pilgrim Booklet. You have to ask at the Kumano Heritage Center at Takijiri for the Booklet. Local buses – are accessible from many places along the route and make flexibility easy to enable changes to walk plans along the way. Signage – is generally but not always excellent.